President Donald Trump wants new Chief of Staff John Kelly to "build bipartisan coalitions" with Democratic leaders on such issues as tax policy and infrastructure. The retired Marine Corps general has focused on avoiding partisan fights within the White House and become a "rare apolitical force," the Washington Post reports. Kelly's appointment won praise from both sides of the aisle as he was sworn in last week to replace the recently ousted Reince Priebus. While Priebus, a former Republican National Committee chair who struggled to gain his footing in the White House, was more partisan, Kelly has assumed a role more geared to running operations smoothly and being a "neutral mediator." As one of the officials put it, the political atmosphere under Kelly is a contrast to when the White House was led by Priebus, a GOP stalwart who "was trained to not work with Democrats and to see them as the enemy." The general's "job has been to develop consensus and negotiate solutions." 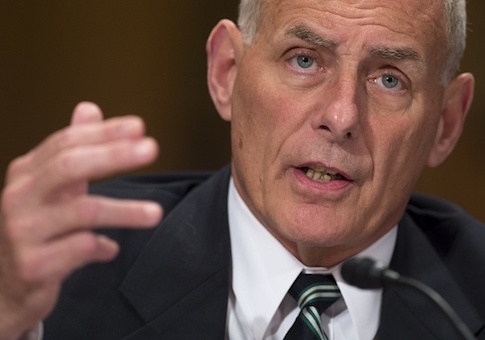 Kelly, who served as secretary of homeland security until Trump tapped him for chief of staff, made overtures to Democratic congressional leaders Rep. Nancy Pelosi (D., Calif.) and Sen. Chuck Schumer (D., N.Y.) right after he took on his new role. As a colonel in the mid-1990s, Kelly was the Marine commandant's chief liaison officer to the House of Representatives. This entry was posted in Politics and tagged Donald Trump, John Kelly, Reince Priebus, White House. Bookmark the permalink.